Good news, spring is in the air after we had just a small taste of warmer weather this past week! If you’re like me, I can’t wait to finally get back outside and enjoy warmer weather after what seemed like a never ending winter. This is one of the many reasons I am looking forward to JLA’s 11th annual Jennifer Summers Barrett Memorial Volunteers on the Run 5K on Saturday, April 28th. I hope that you are signed up to join us, but if you haven’t signed up yet, there is still time. Location, location, location – Quiet Waters Park is consistently ranked by outdoor enthusiasts and locals alike as one of the top locations for running and walking in Anne Arundel County. With more than 700,000 visitors annually, the 340-acre park boasts more than 6 miles of trails with scenic views. Whether you plan on running, walking, or doing a little of both on race day – there will be plenty of beautiful foliage and wildlife to enjoy while on the course. Something for everyone – The Volunteers on the Run 5K is a race truly made for everyone. From speed demons looking for a new PR to those who had to dust off the cobwebs from their running shoes on race morning, and everyone in between. Whether you are out there to run your personal best, or have a fun walk with friends and family, WE ARE ALL WINNERS! Post-run fun – Nothing beats the satisfaction of a post race meal and icy-cold beverage! It is even more satisfying when a portion of the sales of this well-deserved meal are donated to support the community projects of JLA. Following the run, join us to continue the fun at Annapolis Smokehouse & Tavern from 10:30 a.m. to Noon to take advantage of drink specials, where 10% of all sales will be donated to JLA. Annapolis Smokehouse & Tavern is conveniently located right outside of Quiet Waters Park at 107 Hillsmere Dr, Annapolis, MD 21403. I can almost smell the BBQ…YUM! 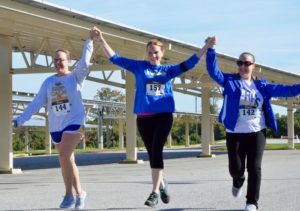 Annapolis’ Most family friendly 5K – We are proud of the fact that we have built a reputation as a family friendly 5K for runners and walkers of all ages. The paved paths of Quiet Waters Park are perfect for strollers – after all, it’s never too early to complete your first 5K! We encourage you to bring the whole family for a fun run and family meal afterwards. Good for you & your community – According to the Mayo Clinic, exercise can lead to a happier, healthier you. This includes helping to combat health conditions and diseases to boosting your energy and mood. Participating in the Volunteers on the Run 5K will not only do good for you personally, but will also do good for your community by supporting the important community projects of JLA. On behalf of the Junior League of Annapolis, we look forward to seeing you, your family, and friends at the starting line on race day!